I had really a really bad amount of gophers last year. Using traps, I was able to kill about 12 of them. I lost exact count, but that is close. I had one that was going after the flowering plants in my little central area. It got a Dr. Hurd manzanita, a Firecracker Penstemon, an Electric Blue penstemon, and started after another before I trapped it. It’s hard to describe the frustration of watching a plant die as a gopher attacks it from below. Usually I would see the gopher mound and know I had one. But, this last summer, a couple of them stopped making mounds, somehow they stayed underground. I thought the heat was just killing my plants. I lost a black sage that was doing very well. It was over two feet tall and three feet wide, looked beautiful. Then, parts of it started dying. Finally, it was all brown and shriveled. It took me several plants dying to see that this was because of gophers. I would bet I have lost at least 15 plants to gophers. After planting it, watering, weeding, watching over it, then to see it turn brown, shrivel, and die, all because some ugly rodent that rearranges my dirt is hungry is really enraging sometimes. But, I got that one. He evaded my traps a few times but I finally got him with the Black Box. 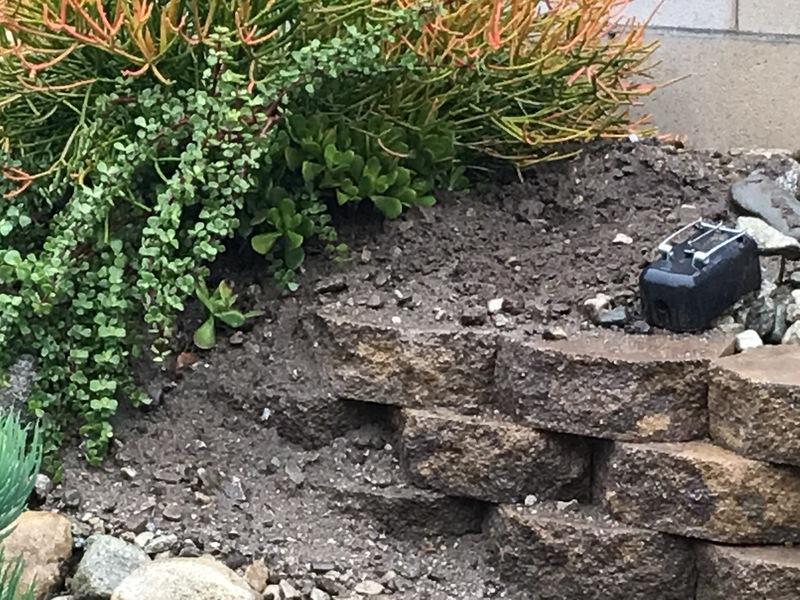 I have another gopher that is digging around the succulents next to and behind my waterfall. This is really upsetting. First, the animal is kicking dirt out of the area and down on the rocks. Secondly, it’s killing these plants. My succulents have been amazingly resililient I must admit. These particular plants are an unknown species to me. I got a gift from my sister-in-law, Martha, and I thought I would just go ahead and plant them. They’ve taken off and look great back there. It’s making me insane watching the gopher destroy them. I’ve been trying to trap it now for several weeks. I have three kinds of traps. I have the aforementioned Black Box, the Easy Set pincer traps, and Cinch traps. I have not yet caught any gophers with the Cinch. The black box is probably the most successful trap. This is a hard plastic box with a spring wire that traps the animal and crushes it when the gopher gets inside. It works because the gopher goes to investigate a “problem” with its tunnel. Gophers, apparently, really hate having openings in their tunnels. There is a small hole at the back of the trap that, I think fools the animal into thinking the tunnel is longer than it really is. So, it goes inside and gets caught. But, this one behind the waterfall has twice simply filled the trap. It happens. Eventually I’m going to get him. He’s making mounds but they are all “inside” the plants where I can’t really get in there. And, I haven’t seen new activity from him for a couple days now. I’m going to keep an eye on it.